Wave energy converters (WECs) will be deployed in groups or “wave farms”. 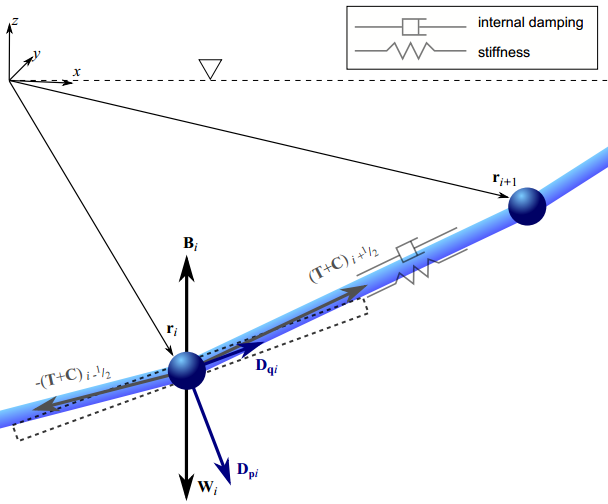 The hydrodynamic interactions between WECs in a wave farm (i.e. how waves that are absorbed, scattered, or radiated by one WEC affect the others) will have siginificant impacts on the overall power performance of the wave farm. A recently published paper by researchers at The University of Edinburgh titled “A novel method for deriving the diffraction transfer matrix and its application to multi-body interactions in water waves” presents a new method for computing wave farm performance with results from commercial software. Using the theory, WEC array interactions can be computed on the order of 1,000-10,000 times faster than with standard methods. However, the method presented in the paper is still somewhat complicated to implement, which would make it difficult for others to employ it. In an effort to accelerate the growth of the tidal energy industry through knowledge sharing and open source initiatives, IT Power Ltd. has the great pleasure to announce the release of ROMS-Tidal-Array (Beta version). This patch can be installed into the Regional Ocean Modeling System (ROMS) software and provides a tool to model tidal turbine arrays based on a tidal turbine parameterisation method, accounting for the momentum capture as well as the sub-grid scale turbulence balance perturbations for each individual device. This modelling tool enables accurate analysing the flow characteristics for impact and resource assessment purposes for reasonable computational costs and therefore enables the use of optimisation strategies to assess different layouts. ROMS Tidal Array can be downloaded from this link.